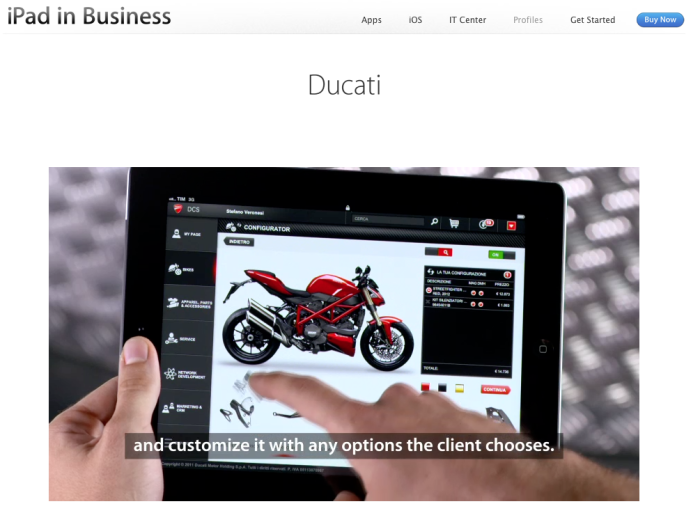 A recent post on the Apple site (Apple – iPad in Business – Profiles – Ducati) highlighted Ducati’s use of the Ipad to streamline production, communication and general information flow. It stressed the transformation of Ducati’s multiple versions and possibilities, which were difficult to communicate to their clients and vendors, into a streamlined system that allowed customization both for the customer and all other parts of the supply chain. One feature of small volume industrial production in Italy is the ability to make small numbers and customize easily. However, this has long been a bugaboo as well, as communicating that to the clients, especially ones farther away, has been difficult, cumbersome and usually out of date. This new “flattening of the information hierarchy” allows what was a difficulty to become a virtue. If one allows the imagination to wander, is it possible to consider Lancia in the 1950s and 1960s in this light, and to see what was burdensome in their production and managment streaming as really a virtue, but one that was not workable due to the difficulties of information flow and structure. In fact, could one even surmise that if this approach to managing and controlling production had been available then, things would have been quite different? Another way to put this is to say that Ducati, as presented in the video, is doing production much like Lancia did some fifty years ago. The difference is that the support structure is now in place to allow that model to work, whereas it was not many years ago.